Ready for lazy river, spray pads & waterslides? The Pooler water park – Surf Lagoon – 2018 season runs from April 21 to August 26. Daily: May 19-Aug. 6. Open Memorial Day. Hours & opening weekend subject to change. Please call (912) 988-1801 or check their web site here. 45 miles from Savannah in Statesboro, Ga.
Water Slides – 2 body slides and 1 inner tube slide wind around each other and finish with a plunge into a common wave pool. The park has a double flowrider , a 5-lane mat racer, a spray pad and slides for toddlers, 3 tube slides, a lazy river. Weekends only: May 19 & 20, Aug. 11-Sept. 3. Open Labor Day Sept. 3, last day of operation. Open daily starting May 26. For hours click here. Summer Waves opening weekend May 5-6; opens daily for 2018 summer season Wed. May 16. 75 Miles from Savannah on Jekyll Island. Weekends only: May 5-6; May 12-13; Aug. 11-Sept. 9. Daily: Wed. May 16-Aug. 8. Open Memorial Day & Labor Day. 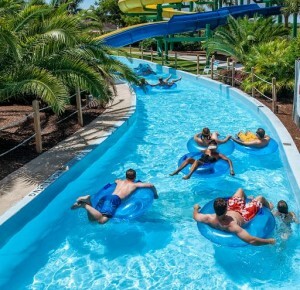 Summer Waves Water Park located on Jekyll Island with 11 acres of splashing summertime fun for the whole family. Nine exciting attractions including six water slides, wave pool, lazy river, splash zone and kiddie area. Fun for all ages, Whirlin’ Waters Adventure Waterpark is located within North Charleston Wannamaker County Park and offers seasonal, island-style water play packed into over 15-acres. •Weekends Only starting May 5. Open Memorial Day May 28. August 18 – Labor Day. This entry was posted on Friday, April 13th, 2018 at 9:41 am	and is filed under Daytrips from Savannah, Summer Fun 2018, Travel/Weekend Outings. You can follow any responses to this entry through the RSS 2.0 feed. Both comments and pings are currently closed.